Guess who got a new cookbook! Yup, yet another new baking book for this girl. I was flipping through the pages when I first got it, and there are so many delicious-looking cookie recipes that I can’t wait to try. I swear I just bookmarked every single page in that section. 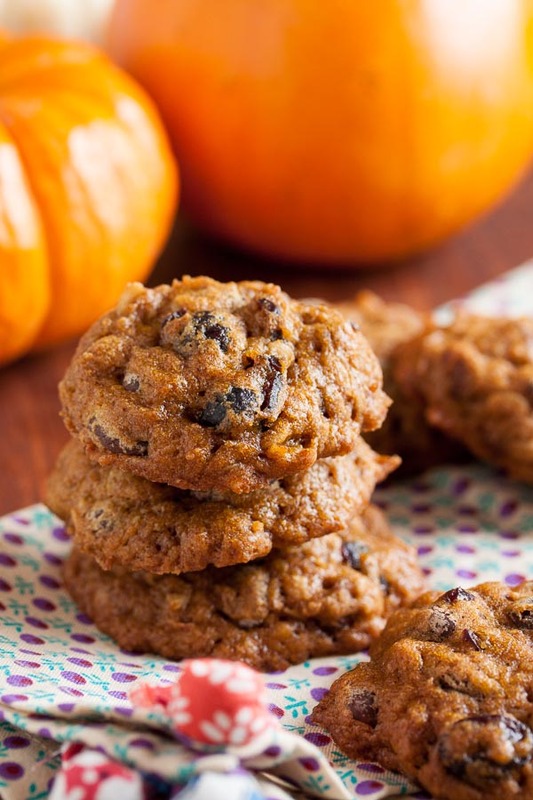 And first up is a pumpkin cookie, because it’s that time of year again – pumpkin season! I made pumpkin cookies for the first time last year, and they were so good I knew I wanted to make some more this year. 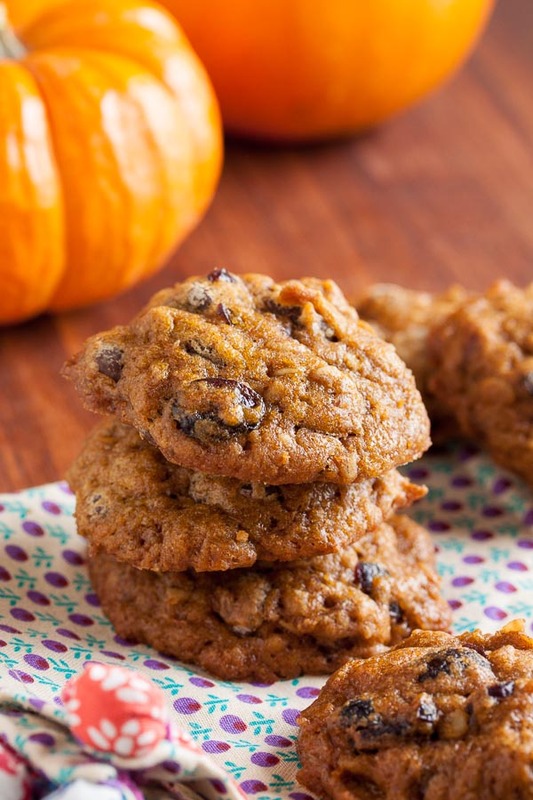 And this recipe takes the idea of pumpkin chocolate chip cookies and bumps it up even further with the addition of dried cranberries and toasted pecans. I’ve made pumpkin muffins before with chocolate chips and cranberries, and that combination of flavours works amazingly well together. 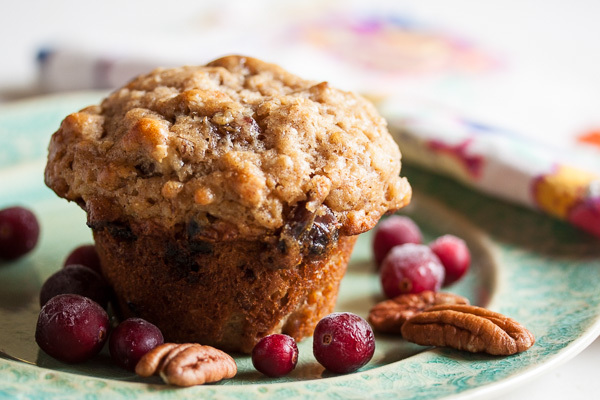 Love those muffins – you should try them too. And the idea of adding toasted pecans really appealed to me, so I was sure I’d love these cookies. And yes, yes, I did love them. And so did everyone else. 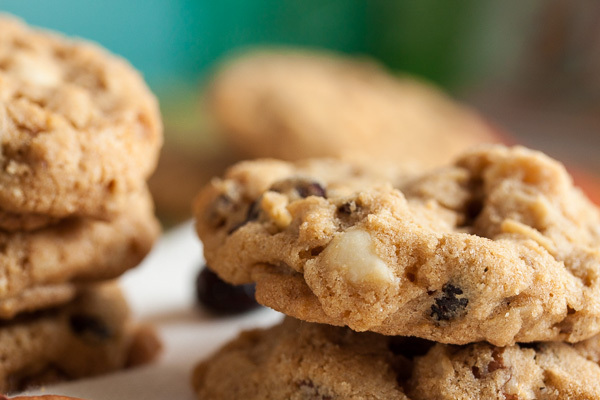 These cookies are incredibly soft, with a texture more like a muffin than a cookie (much like the banana walnut chocolate chip cookies I made awhile back – also delicious, you should try those too!). Like tiny muffin tops, really. The balance of spices is perfect, and fresh from the oven, while they’re still warm and the chocolate is all melty, they’re amazing. I ate a lot of these fresh from the oven. One of my coworkers took a couple from the cookie jar and started eating one as he walked away, and turned right back around to grab a few more. Another coworker made a point of emailing me to let me know how fantastic these cookies are. And several people have asked for the recipe. These were really popular! Adapted from Tate's Bake Shop: Baking For Friends, by Kathleen King. The recipe says it will make about 60 cookies, but I got 78 cookies using my usual slightly-larger-than-tablespoon-sized cookie scoop. *Note: The original recipe specified a 15-ounce can, but the closest I could find was 13.5, so I just used that and they turned out great. I think you'd be safe with either size. In a medium bowl, whisk together the flour, rolled oats, baking soda, baking powder, and all the spices and salt. Set aside. In the bowl of a stand mixer fitted with the paddle attachment, beat the butter and sugars together on medium speed until light and fluffy, about 3 or 4 minutes. Scrape down the sides of the bowl and add the pumpkin, followed by the eggs, one at a time, beating well after each. Add the vanilla and beat again to incorporate. Turn the mixer down to low and add the dry ingredients, mixing until just barely combined. 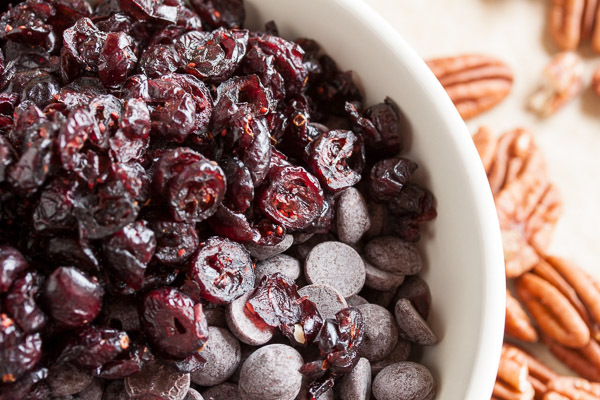 Remove from the mixer and add in the chocolate chips, nuts, and dried cranberries, either with a spatula or by hand. I prefer to knead inclusions in by hand to ensure they're distributed evenly, but this batter was so soft I had no trouble doing it with just a spatula. Bake for about 15 minutes, until they spring back when pressed in the centre, rotating the baking sheet halfway through the baking time. Allow to cool on a wire rack for a few minutes before removing the cookies from the pan and allowing them to cool completely. 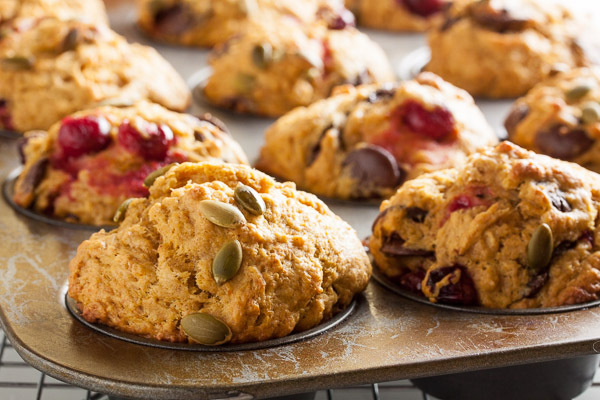 Wow, pumpkin, chocolate chips, cranberries, AND pecans?! These cookies sure are stuffed full of all sorts of tasty things! They look irresistible!